©2007 Betsy Malloy Photography. Used by Permission. It might sound like some kind of flowery, hoity-toity tearoom, but it isn't. In fact, Hollyhock House is a groundbreaking home designed by Frank Lloyd Wright, who ranks among the greatest and most influential architects of all time. When you're an heiress with a fortune to spend, you can hire the world's most famous architect to design your dream project: a home, two other residences, a theater, a director’s house, an actor's dormitory, artists' studios, shops and a motion picture theater. In 1919, that's just what Aline Barnsdall did. She chose architect Frank Lloyd Wright to make her dream a reality. The house gets its name from the stylized flower forms that Wright designed into its concrete blocks. In fact, they're so stylized that you might not recognize them as flowers unless someone showed you. The planned project was never completed, but the main house, garage, and one artist's residence were built and are still on the property. What is There to See at Hollyhock House? It's easy to stop by to see Hollyhock House if you're in Hollywood, Griffith Park, or downtown LA. It's in a city park that has great views, and you can take a self-guided tour, so why not? Besides the main house, you can also see (but not tour) a Wright-designed apartment building. The original garage is now the visitor center. The city park also includes an art center and theater. They host movie nights and wine tasting events. Some of the landmarks sights you can see from the hilltop include the Griffith Observatory (large white structure with black, dome-shaped roofs), the Hollywood Sign. Hollyhock House is a must-see for fans of architecture and even more so if you love Frank Lloyd Wright. It looks better than ever. Project Restore oversaw a much-needed restoration completed in February 2015. If you don't like architecture, skip it - unless you just want to go to see the views. Some visitors are disappointed that the self-guided tour doesn't let you explore the whole house. You can see the outside of Hollyhock House even when it isn't open for tours as long as the surrounding park is open. It's worth a stop just for the panoramic city views. Allow about an hour to tour the house and see the structures from the outside. You can enjoy the house anytime, but you can see more if you go on a clear day. Parking can be hard to find, especially when there's an event going on in the park. Bring a lot of patience or take public transit. Leave the camera in your pocket during the tour and forget about posting a selfie from the living room. Photography is not permitted. Much of the house is accessible, but some rooms require climbing steps to see. Unfortunately, there is no cafe at Hollyhock House. 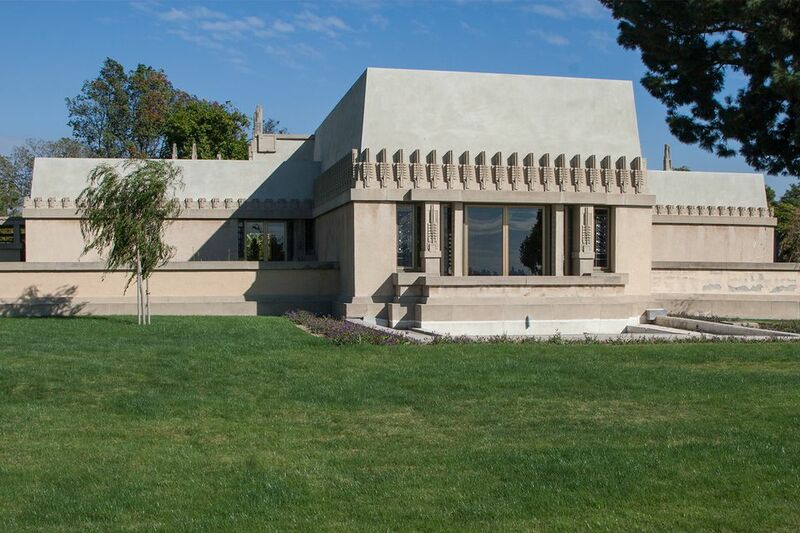 Hollyhock House was designed in 1917 and built between 1919 and 1923 for oil heiress Aline Barnsdall, an independent young woman who loved the arts. She purchased a large tract of land and intended to build an arts colony that would include a home for herself and her young daughter, two secondary residences, artists' apartments, a theater and shops where resident artisans could sell their creations. Frank Lloyd Wright's design motif for the Hollyhock House complex comes from Barnsdall's favorite flower, the hollyhock, a tall-stemmed plant with flowers running up the stems. Wright created a geometric interpretation of it. He used that in the textile blocks and throughout the house. Combining many architectural styles for his first California commission, Wright named the result California Romanza. Breaking his rule that a house should never sit on top of a hill but instead just below the "brow," he designed Hollyhock House squarely on the hilltop to take advantage of 360-degree views that are some of the best in the Los Angeles basin. While Hollyhock House was being built, Wright was busy working on Tokyo's Imperial Hotel, and travel to the faraway city took 11 days each way by boat. Barnsdall also traveled extensively, and the two rarely found time to meet. Wright left details of Hollyhock House's construction to his son Frank and Rudolph Schindler, both of whom became influential Los Angeles architects. Because of the owner's and architect's schedules, poor communication plagued the project, leaving Barnsdall frustrated. She later complained about many parts of the house she didn't like. Like most Wright projects, costs far exceeded estimates. By the time three residences were built, Wright and Barnsdall parted ways, and the rest of the planned complex remains uncompleted. Barnsdall moved to one of the smaller residences before her death. Afterward, Hollyhock House was used for various purposes. By the 1950s, one of the residences had been torn down. Today, the second one languishes in need of repair. You can see it and the garage in the next two images. A seismic retrofit project in 2005 made Hollyhock House safe for tours and facilitated the research needed to restore the living room to its original color scheme. Another renovation was completed in 2015. The Hollyhock House project initially encompassed more buildings, but it stopped after two guest residences were completed. This building is one of them, called simply "Residence A." This building which was the original garage is now the visitor's center. It was completed in 1917. Visitors can walk in for a self-guided tour any time the house is open. They charge a small admission fee. Children under 12 get in free with a paying adult. The house closes on many holidays and annually in October for maintenance. Check the schedule on their website. If you want a private, docent-led tour, they're held on selected weekdays and require reservations. You can get to the Hollyhock House on the MTA Red Line, but it's a long walk up the hill to reach it. Get off at the Vermont/Sunset stop. Hollyhock House is one of a few California Wright sites that are open for public tours. You can get a list of all the Frank Lloyd Wright tours in California in this guide. It is also among the 17 Wright buildings named his most important works by the American Institute of Architecture, three of which are in California. The others are the V.C. Morris Gift Shop in San Francisco, and the Hanna House in Palo Alto. Hollyhock House is one of Wright's designs which is on the National Register of Historic Places. Others include the Anderton Court Shops, Ennis House, Samuel Freeman House, Hanna House, Marin Civic Center, the Millard House, and the Storer House. Wright's work isn't all in the Los Angeles area. The San Francisco area is also home to eight of them, including two of his most important works. Use the guide to Frank Lloyd Wright in the San Francisco area to find them. You'll also find several houses, a church, and a medical clinic in some of the most unexpected places. Here's where to find Wright sites in the rest of California. Don't be confused if you find more "Wright" sites in the LA area than are mentioned in our guide. Lloyd Wright (son of the famous Frank) also has an impressive portfolio that includes Wayfarers Chapel in Palos Verdes, the John Sowden House and the original bandshell for the Hollywood Bowl. The large, mud-colored structure almost directly across the valley from the Hollyhock House is the Ennis House, another Frank Lloyd Wright-designed home. If you're an architecture lover, check this list of famous Los Angeles houses that are open to the public, including Richard Neutra's VDL house, the Eames House (home of designers Charles and Ray Eames), and Pierre Koenig's Stahl House. Other sites of particular architectural interest include the Disney Concert Hall and Broad Museum in downtown Los Angeles, Richard Meier's Getty Center, the iconic Capitol Records Building, Cesar Pelli's boldly colored geometric Pacific Design Center.